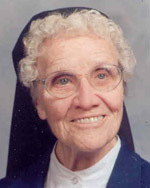 Sister Charles Miriam Keltz, I.H.M. Sister Charles Miriam Keltz, I.H.M., died in Camilla Hall, Immaculata, on March 14 in the 76th year of her religious life. She was 94 years old. Born in Philadelphia, she entered the Congregation of the Sisters Servants of the Immaculate Heart of Mary in 1939 from St. Raphael Parish, Philadelphia, and professed her vows in 1942. Sister Charles Miriam taught in various elementary and secondary schools in the Archdiocese of Philadelphia and the dioceses of Allentown, Harrisburg and Miami. She served at John W. Hallahan Catholic High School for Girls for over 25 years before her assignment to Camilla Hall in 2010. The funeral Mass was celebrated at Camilla Hall on Friday, March 18. Msgr. Joseph Logrip was the celebrant and homilist, with Father William E. Dean concelebrating. Sister Charles Miriam is survived by members of her religious community, her sister, Sister Gloria B. Keltz, O.S.F. ; sister-in-law, Helen Keltz (Charles) and many loving nieces, nephews, grandnieces and grandnephews. She was predeceased by her parents, Charles and Mary Elizabeth Callahan Keltz and her brothers Charles, Robert (Betty), Bernard, and her sisters Louise (William) Gibbons, Joan (Frank) Graf, and Elizabeth (Charles) Lawson.